There are certain things you can do when moving to make your moving day a less stressful day. In particular, the packing preparation is vital to a more straightforward moving day. As one of the oldest San Diego moving companies, we hope that these seven packing tips are helpful based on 20 years of experience. #1. First, decide if you want to pack yourself, or you want to hire a professional packing company. This service makes packing a lot easier, and typically packers are paid by the hour, plus supplies. Some moving companies allow you to provide your own moving supplies and others require that you buy them from the moving company. Regardless, almost all moving companies will provide a service to either move a few rooms or your whole house. If you decide to pack yourself, don’t wait until the last hour or day to start packing. It will take longer than you think to pack all your household items. Give yourself plenty of time to pack. This will reduce the stress of being under a short timeline before the move. #2. Use certified corrugated moving boxes. Using quality moving boxes will save you the despair of home items being damaged using flimsy boxes. Local movers are able to be faster when they can easily stack the boxes on top of each other in a dolly. Also if you are hiring professional loaders to pack a portable storage unit or a rental truck, you will be able to use a smaller size if your movers can maximize space. Movers will then know which room your belongings should be placed and what is inside, versus having to verbally direct them for each box. This will save you money moving when paying by the hour, as your movers can be faster. Also, the last thing you want is all of your boxes stacked in your living room because your movers did not know where to put them. #4. Do not pack anything hazardous or flammable. Either dispose these items or transport them on your own. These items can ruin other belongings and/or risk the safety of the movers and/or your family. #5. Save a box or two or three for yourself. Any valuable items like your social security cards, birth certificates, gold bullion, Picasso’s, your etc. should be packed and moved by you and you alone. This will avoid any potential misunderstandings with the moving company. It is important that you do not have movers transport irreplaceable items that you could easily move. (I.e. Your Grandmothers wedding ring that means the world to you) move this yourself! #6. Go through what you really need and want to keep when you are packing. There is no reason to pack and move shirts or pants you haven’t worn for 10 years. Take this opportunity to unclutter your home. #7. Unhook and unplug all your appliances. Freezers and refrigerators should be unplugged at least a day before to defrost and let the excess water leak out. If you wait until the day of the move to unplug your refrigerator or freezer you run the risk of your items in the moving truck getting wet. 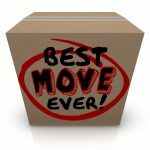 Discount Movers provides local San Diego moving services where we work hard to make hard to make your moving day a great day! See our moving and packing FAQs for more helpful tips.